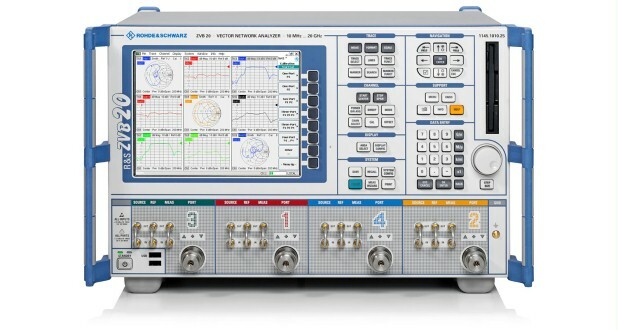 Built using innovative hardware and software concepts, the vector network analyzers of the R&S®ZVB family set new standards: One generator can feed two test ports simultaneously. This makes parallel measurements possible, significantly increasing performance despite the complexity of the measurement task at hand. The R&S®ZVB series of vector network analyzers covers the frequency ranges from 10 MHz to 14/20 GHz. It has been designed for universal measurements on passive and active components. The R&S®ZVB series greatly simplifies vector network analysis especially for multiport measurements and measurements on balanced devices. Featuring comprehensive measurement functions, excellent specifications, high measurement and data transfer speeds and remote-control capability, the analyzers of the R&S®ZVB series are an ideal choice for both development and production applications. The compact versions of the 14 GHz and 20 GHz two-port models leave ample room for test setups in the lab, featuring a height of only 24 cm and a depth of 42 cm. 1) Power level that can be electronically swept. 2) Number limited only by internal memory.